I've always imagined nature reserves as places restricted to idyllic countryside landscapes, so imagine my surprise when I discovered that Merton has its very own nature reserve. Even more so when I heard that the site was once a sewage plant. Hey, I know which I'd rather have. Train passing by in the background. According to historical maps, back in 1847, the water meadow was known as Byegrove Mead. Twenty-one years later, the Wimbledon-to Streatham railway was built alongside it, which still runs today. Despite this, the odd passing train does little to disturb the tranquil setting. Then in 1877 the Wandle Valley Sewage Works took over and built adjacent to the Wandle River. The park is surrounded by small, attractive homes down pedestrian pathways. When the sewage works closed down in 1970, Wimbledon Football Club proposed building a stadium there, but it was met by heavy opposition. It took until 1989 for them to finally drop the campaign, which allowed the Nation Trust to buy the land. Now part of the Wandle Trail, Wandle Meadow Nature Park is in a residential area that gives locals a nice place to walk and get away from it all. If only for an hour. The initial entrance brings you to a clear patch of grassland with a few surrounding trees and shrubs, but walk a little way down, and you will get to an underpass, which takes you to the meadow and patches of woodland. Evidence of its former use. Numerous pipes can be spotted sprouting from the ground as evidence of its former history as a sewage plant. Some of these are blocked up, while others are not. Some are in plain sight, and some are hidden away behind shrubs and fallen trees. It is actually quite fun to go on a hunt, and see how many you can find. In the middle of the meadow is a fenced area with planted trees. It is freely available to walk through, so I'm not quite sure why there is a fence around them, but I'm sure there is a good reason. Perhaps it is just a feature, because it does draw your attention, and splits the meadow into two directions. One that leads out of the park, and one that takes you into the woodland. Although it had been raining earlier that day, the park was not as muddy as I expected it to be. The paths are made from an absorbent red clay, and even when I went into the woods, it was fairly dry. Although some parts were overgrown, there were a number of cut back areas too, including two circular clearings that looked like the gathering place for a witches' coven. Wandle Meadow Nature Park has a wealth of of plant life, which includes hawthorn, silver birch, ash, hazel, field maple, dog-rose, and blackthorn and many more. 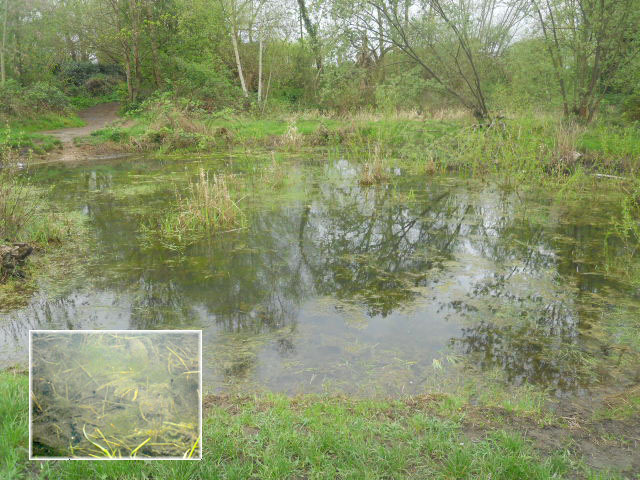 My favourite part of the reserve, however, is a marsh pond inhabited by frogs, toads, and newts. Looking closely, I could see the tadpoles wriggling around. When you go to the park, you have the choice of walking on the designated paths, or exploring the more overgrown areas. My insatiable curiosity to see what might be lurking behind the high walls and shrubs meant that I chose the latter. Climbing steep inclines and clambering over fallen trees probably won't lead you to some ancient discovery (although I did see earthenware buried in the rocks, so you never know), but it sure is fun. Children will also enjoy the expedition, as is shown by a blue plaque commemorating a momentous event, in which a nine year old girl built a camp under a tree. 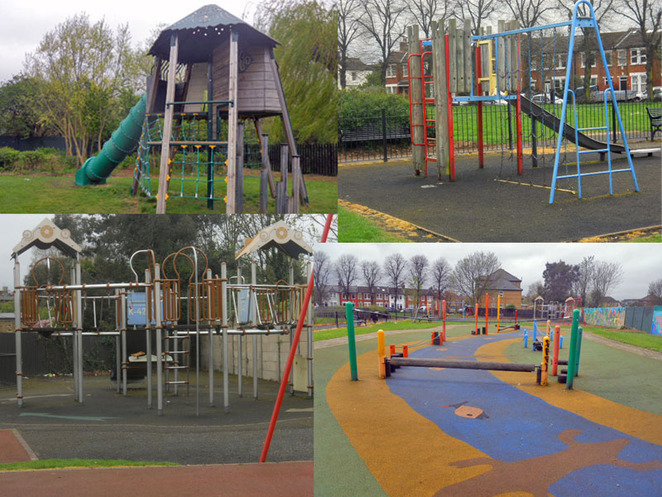 Children can also enjoy Garfield Recreation Grounds, which is just next door (or next gate) over. There are four playing enclosures, including a basket ball court, climbing tower, playground with climbing frames, slides, swings, and balance boards, and an area for toddlers. One of the walls is brightly painted with sea life. What? You were expecting an orange cat? It was painted by the children of Garfield Primary School as part of a Dancing Decor commission. 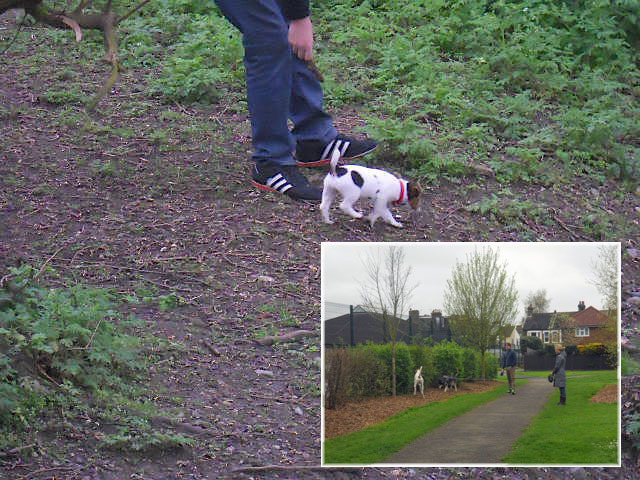 As well as the playground, there is a large field, extremely popular with dog walkers. They tend to start out in the open field, and then make their way into the nature reserve for a woodland walk. I saw tons of dogs that day, including a rough collie, husky, great dane, staffie, westie, corgi, and a jack russell puppy that would almost fit into the palm of my hand. By this point you are probably wondering what happened to The River Wandle; the park is named after it after all. Well, I assure you that the river is there. It runs around the edges of the park like a boundary line, and there is a bridge crossing over it to the playground. Aside from pond creatures and dogs, the park is home to many woodland creatures, including ducks and squirrels. I always like spotting a squirrel in the trees.